280 gsm luxury textured faux linen,which is skin-friendly. Lined with 140gsm blackout fabric. It can blackout 95% of sunlight, thermal insulation, reduce noise, save energy. Material: 80% linen and 20% polyester blend. Fabric Weight: main fabric 240 gsm, back blackout lining 140 gsm in white. Fit for: Work for rod or pole in living room, bedroom, patio door, club, hospital, room divider. Feature: Solid, heavy and drapable. Lined with 140 gsm blackout fabric in white to block 95% of light and insulate thermal. Colorways: More than 15 colors to select. The panel width is the width with pleats already set in the panel. You decide how many panels to cover your window or patio door according to the fullness you need. We suggest fullness 1.0X-1.2X. 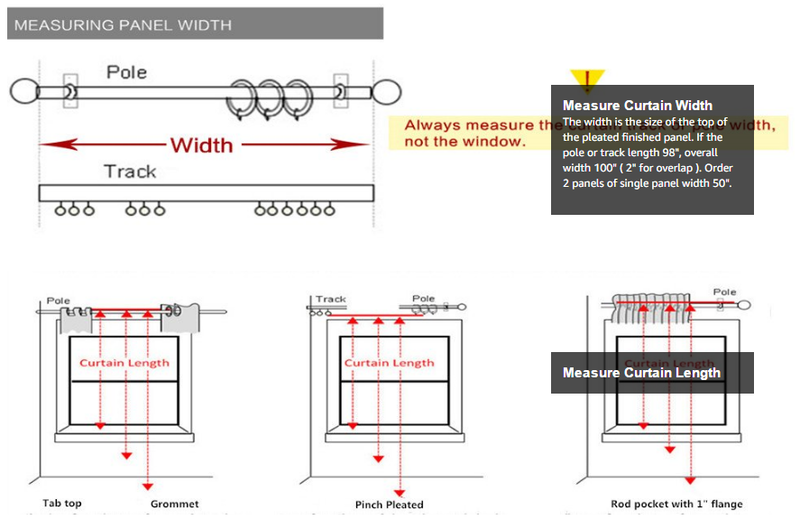 For example, the overall width of traverse rod ( from end to end) or rail track is 104", then you need to choose 2 panels of each 52"- 62" ( for overlap) wide or 1 panel of 104"-125" wide ( could be customized). 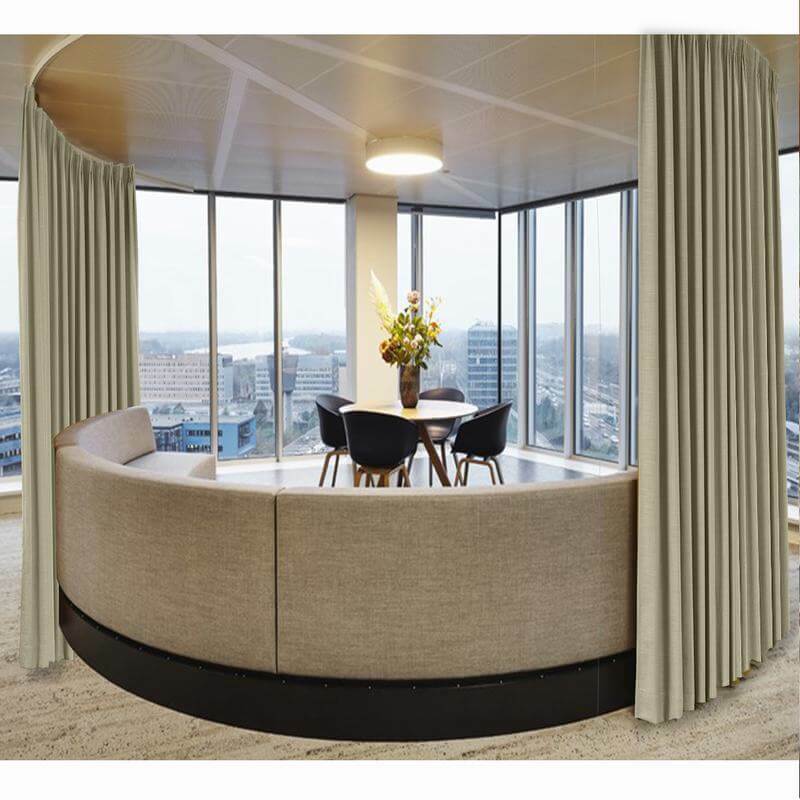 Curtain is sold per panel, not pair. Love these drapes highly recommend them. If I ever need drapes again I will definitely buy them here. The only thing I was worried about was that they were from China and was concerned on quality, but when I got them they were great. Product is just perfect, seriously. I purchased a snow-white pinch-pleat panel and it arrived with the plastic hooks required to hang it. Inserting the hooks and hanging the panel took a total of ~10 minutes. Size is exactly as ordered. Looks and feels like a very quality product. Packaging was torn on arrival. Could have been DHL's fault but the zipper-bag containing the curtain was torn as well. The product was not affected in this case but if the damage to the packaging had occurred in a different place, the product could have been affected. I'm purchasing three more panels and taking my chances with the packaging. Two pages curtains , provided us with a beautiful custom made curtain, I really recommend them and for sure we will use them again! 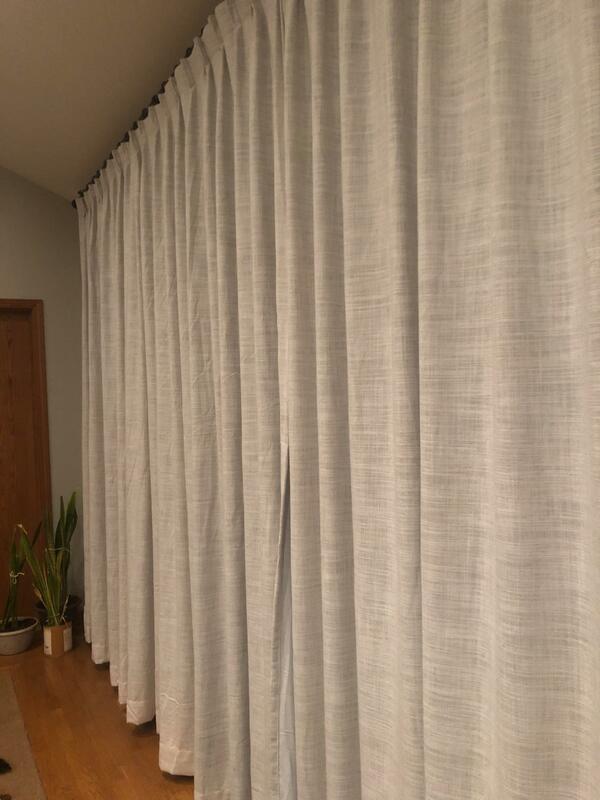 We ordered 96 linen(beige) color pinch pleat drapes for our large three window setting in our living room. We couldn't be more pleased. They are so well made and look much more expensive that the price we paid. We have hung them on black rings on a black metal rod and they look terrific! Quality craftsmanship and quality materials! I concerned about buying drapes sight unseen. However, I was pleasantly surprised upon receiving the drapes. The quality was better than I expected. The color matches my comforter perfectly. My walls are a pale pink and soften the drapes just enough. So pretty. I also had a question about the order. My response time was very timely. I would like to say thank you. Nice fabric. Well constructed. Absolutely perfect for what I needed. 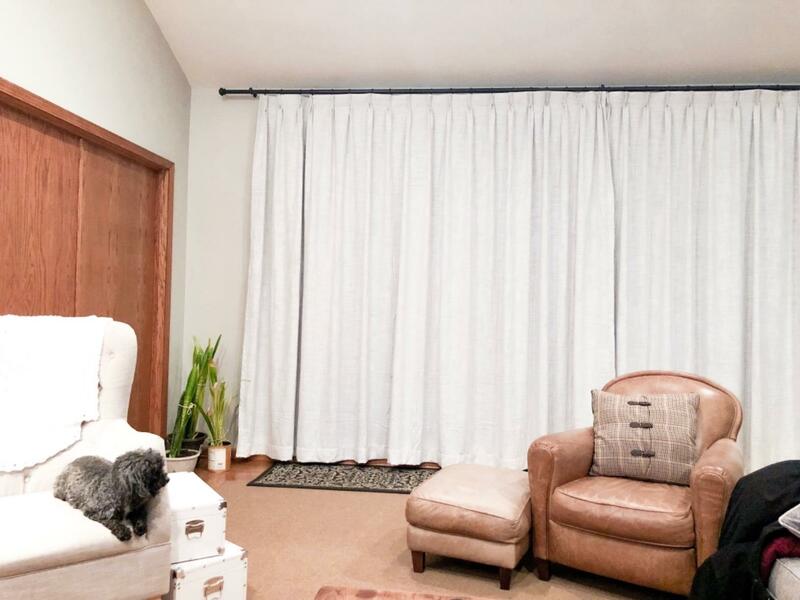 We installed this patio panel in our TV room, to eliminate glare on the screen and reduce the acoustic brilliance in this room with its laminate floors. The measurements were accurate, and the seamless drape hangs straight. The linen-like fabric is heavy and drapes nicely. The blackout lining works well. These drapes are heavy, they look and feel good. These curtains are very well made with great fabrication and I am very pleased with the product. What really sets the company apart is the great customer service. They worked with me to correct several ordering mistakes I made and ensured that their product arrived before Christmas, as I hoped. They really went above and beyond. You cannot go wrong ordering from ChadMade. The curtains are beautifully made, look and feel expensive for a very reasonable price. Top notch customer service. Highly recommend! I had a pleasant experience even though I didn't know the drapes were coming from China. Now I have confidence that things will make it here. The drapes were fine and fitted just right! The price was right. They were exactly what I needed. The quality was superb. Thank you so much! I'm completely satisfied! 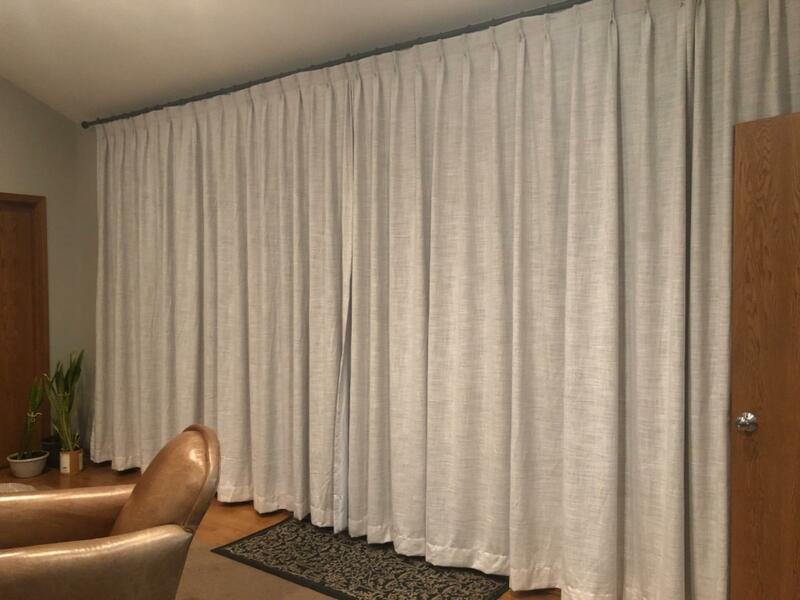 We installed a double track for sliding door in our bedroom and chose this curtain to go in front of the sheer white curtain. This curtain does a nice job of blocking out even the harsh Arizona sun. I'm happy with the curtains . Well made , look good and delivered faster than I thought would be . Would buy again. Nice quality, heavy, linen look, but not blackout. It was a lot of effort to iron, as they are thick and heavy. I have normally arranged to get custom drapes for the living room, but I decided to take a chance on these drapes. They are everything they said they would be. Good quality, size was correct and it blocks really well. I would order these again. I shopped all or most of the box stores looking for drapes to cover my patio door. Selection and price were few and far between. The best thing about this purchase was the ability to see the actual material and color online before clicking the buy now. When arriving and opening the package the match was exactly the same. Height and width were right on and they hung perfectly on the curtain rod. The backing material behind the pleats and sewen to the material was very stiff and provides excellent backing the hooks slide into. This provides a strong even line across the top and holds the pleats even. The material itself is heavy and looks very rich in color. We are very happy and pleased with the quality and attention to detail of the stitching. The hooks to hang the curtains were provided and sure was a plus. The enclosed catalog of services offered was a nice touch for our consideration in any future purchase. Thank you for a excellent quality product. Perfect curtains arrived quickly nice craftsmanship best prices\options\quality\customer service around. These look identical to the photo (Grey beige color). The pinch pleats are well sewn and reinforced, the hooks are easy to use, and the curtains went through the washing machine without problem. Almost don't even need to iron after washing and hang drying. The lining is nice and blocks a good amount of light. I have bought many other poly linen blend drapes, however they always had a shiny sheen to them and these drapes are NOT SHINY. They actually have the flat sheen of linen. Finally, I found drapes that I love without the price tag of paying for 100% linen. I am very please with everything about these drapes. They are well made, heavy and provide nice room darkening. It was worth the wait for shipping time. I'm glad I ordered these and would order again from this company.